Wedding Quilt Pattern - Heartwaves with Diamonds - Wedding / Valentine 7 Love / Heart Quilt - King size: 100" x 100"
Heartwaves with Diamonds in the colors of cream, gold, crimson and ruby - this is a very elegant wedding quilt a mom or grandma would make for the beloved young couple to cherish and remember. The piecing is based on the traditional "Storm at Sea" blocks. It can be paper pieced or traditionally pieced - the choice is your's. The pattern gives instructions for both. 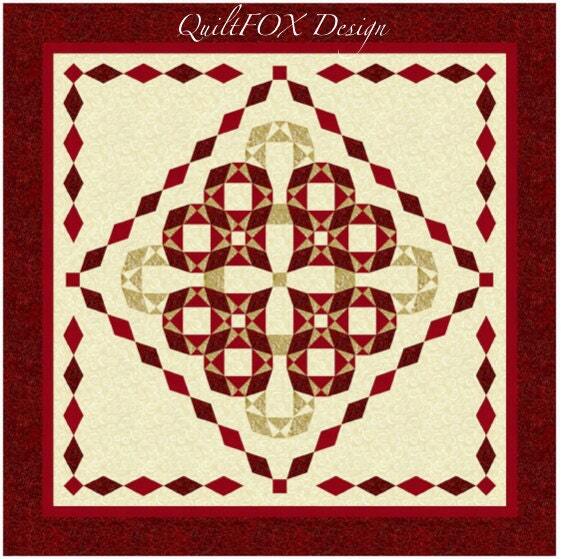 - finished and unfinished sized for blocks, sashes, borders and building parts of the quilt to provide checkpoints. Please open the pattern with the latest version (11.0.14) of Adobe Acrobat PDF Reader to display and print everything correctly. You can print the pattern in booklet format to save ink and paper. Templates and/or foundation papers have to be printed with "Actual size" printer settings.